The Inspirational Wendy Braun – On Balancing Career and Family. After interviewing the lovely Jennifer Weedon, I thought I would reach out to some other juggling actor/moms who inspire and excite me. The first person that popped to mind was the inspirational Wendy Braun. Wendy has enjoyed over a decade working in TV, Film, Commercials and Voice-Overs and is also the founder of ActorInspiration.com. I’m a huge fan and use her guided meditations regularly before auditions. Wendy has generously shared so much great advice, she even has a FREE GIFT for you all!! –What are the biggest challenges in juggling being a mom and an actor? Any surprises or misconceptions? I remember when I was pregnant with my first child, and I had a day with 4 auditions, and I came home and lost it, and thought HOW am I going to do this once I have a baby!? And, like anything, you just take it a day at a time and you figure it out. Now that I have two under the age of 4, I realize it IS possible to balance it all, you just need to breathe, always pack food for yourself and have a support system (whether it’s another actress mom or a nearby friend or some part-time help). My husband, Josh Coxx, is also an actor, so every day is really about balancing a bunch of spinning plates. We somehow make it work. A calendar and a sense of humor help. -Any tips/advice for creating balance in your career/family balance? I think the best advice, whether it’s in acting or life, is to be IN THE MOMENT. It’s easy to feel like you aren’t measuring up in either area and sometimes “mom guilt” can get out of control. When I am auditioning or working, I make sure I focus all of my energy towards my work. When I am with my family, I’m 100% there. I’m not checking e-mail, or reading sides. When you are with your family, put the technology down! I get sad when I see parents at the park sitting on a bench with their head in their smartphone. It’s a pretty good way to miss a childhood. On the flipside, when you are auditioning or shooting, let go of the guilt. Your baby or child will be okay. Find positive ways to focus on your work. Being present in the moment –whether in acting or life—is always the key. The best gift you can give to your kids is a happy parent. Finding a way to make peace with where you are. When things are slow, don’t fret it, just enjoy that family time and know the Universe has a divine plan. Some days it just might be for you to get your feet all sandy in a sand box. -I love your Creating Powerful Auditions CD and Guided Meditations and find them even more vital now that I have a child – to take the time to center myself both before an audition and in life generally. Have you had to create any new habits? Transportable Positivity. I’ve started to create ways to realign myself quickly every day. We all don’t have time for a 30 minute bubble bath, but I’ll put affirmation reminders in my phone. I listen to a quick guided-mediation, or instead of checking Facebook, I’ll read something uplifting while I wait at an audition. I tweet positive affirmations for actors daily on twitter. It’s about having quick and easy tools for this fast paced life we lead. In fact, when any of your readers sign up for my free newsletter, they’ll instantly receive a free Guided Meditation MP3 to help release audition anxiety and nail their next audition. Take your time.. I won’t get out of my car at an audition until I feel focused and confident. And if I’ve been rushing from mom duties to an audition, I won’t sign in until I feel ready. I don’t allow anyone to rush me, no matter what. Write everything down. I’ve always been a list maker and goal setter, but now I have a lot less time to accomplish personal goals. I have a “to-do” list for Home, Career, Family, etc. This way at the end of a long day when you don’t even know which way is up, you can go back to your list and see what inspires you. Some days it might be to take a break from it all, but at least your head won’t be spinning with all the things you need to do. Get it out of your head and on to paper. Don’t use kids as an excuse to not work out. When you are feeling good and in shape, you will be a happier mom! I don’t go to a gym anymore, but I found a workout class within 2 minutes from my house that has childcare. I signed up for unlimited classes because the childcare was then free. Now I have NO excuse not to go. We call it “mommy’s dance class” and both of my boys now love it there and I have gotten into the best shape of my life! And if that’s not in your budget, meet another mom and go for a run with a jogging stroller. When you make your fitness a priority, you will begin to feel better, look better and you will be sending a great message to your kids. Create time for yourself. Most moms can’t meditate quietly in the corner for 20 minutes in the morning. My kids are up at 6:30, and unless I’m going to wake myself up earlier (which I’m not!) it doesn’t really happen. BUT, finding other moments in the day is essential. Whether it’s taking a longer shower, sitting in your car for 5 extra minutes and just breathing, or handing the kids off while you get a quick manicure is so necessary for your own well-being. 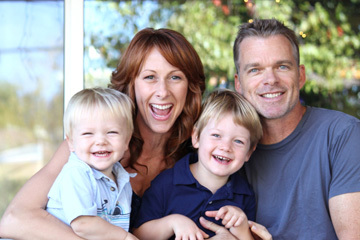 Wendy and her beautiful family! -How has being a mom helped your acting work or your career? And vice versa? Yes! I’ve been playing mom roles for a long time, but now, the depth of experience and understanding I bring to my work is so much richer. Also, it’s opened up a lot of great conversations with casting directors, producers and directors. And on the set, even the quietest of celebrities seem to light up when you mention you have kids. On the flipside, I love coming home from shooting and seeing my kids faces light up as I walk in the door. It’s the best! -What advice would you give someone who is considering having kids but is worried that it will hurt his/her career? Know what you really want. My favorite acronym for worry or fear is that it’s usually False Evidence Appearing Real. I think the first real question to ask yourself is, “Do I want to look back on my life and have had a family?” If the answer is yes, then the rest will work itself out. I looked for examples of amazing actresses who also balance a family life, and found a lot! It’s all about perception, so be aware of where you are looking. And often, when you are focused on something other than your acting career 24/7, that’s when things can tend to delight and surprise you. 1). Teach your kids to put their toys away, so at the end of the night you have your house back! When you make everything a game-they’ll participate. I have bins under the coffee table, and we play “legos in the bucket,” and my older son loves seeing how many he can toss in there. 2) When it’s not working, turn it into a song. When your kids see you have fun they are more likely to participate. I literally make up a song just about everytime I need something done. (My husband laughs at me, but it works!) Whether it’s bath time, pj time, bed time or getting our shoes on to go out the door, start making it a rhyme! At the very least, you’ll crack yourself up instead of getting upset. 3) Schedule a date night. Even if it’s swapping childcare with your friends and just going to an early dinner. Or getting a sitter and going to a daytime movie. Whatever it is, keep the love alive in your marriage by continuing to date! I still write love notes to my husband and stick it in his cooler before he goes surfing. I guess at the end of the day, it’s all about making sure everyone is well-fed…physically, mentally, emotionally + spiritually. Just don’t forget to feed yourself first. And Don’t forget your free gift! If you sign up for Wendy’s free Actor Inspiration newsletter, you’ll instantly receive a free Guided Meditation MP3 to help release audition anxiety and nail your next audition as well as her Monday Morning Mindset meditations. Subscribe here. A Final Thought: Here’s some transportable positivity – part of Wendy’s Monday Morning Mindset series she created free for actors. I really loved this. It shows that the little things do count. I especially like how she reminded us to make time for ourselves, even just here and there. I’m not a mother, but balancing a plethora of survival jobs, teaching yoga, acting and writing, I need to be reminded of this! Thanks for the post.